Posted January 20, 2004 in Articles and Ecology. I love watching ravens fly. They seem to delight in performing a wide variety of aerial acrobatics. Other birds seem to fly primarily for practical purposes: searching for food, avoiding predators, or simply moving from place to place. Ravens, however, often seem to cavort in the air with joyous abandon simply because it is fun. Since they don’t seem to rely on speed or manueverability to obtain food, it seems unusual that they would be such skillful flyers. Maybe they have found that flying can be used for play as well as for practical reasons. I have often seen them do a “barrel-roll”, and sometimes they even do two or three in quick succession. Ravens can even fly briefly upside down. Their most exuberant flights seem to be during their mating season in late winter and early spring. Then they can be seen chasing each other and performing acrobatic tricks in tandem. While it is certainly understandable that their mating flights would be boastful and exuberant, they also do barrel rolls, swoops and flips at other times of year. They even seem to enjoy flying on those -30 C and -40 C winter days when no other birds can be seen in the frigid skies. Any bird that incubates eggs in April when cold nights and snow are not only possible, but very probable, has to be well adapted to the cold. Possibly their inky-black colour allows them to absorb more heat from the sun and is an adaption for winters in the north. 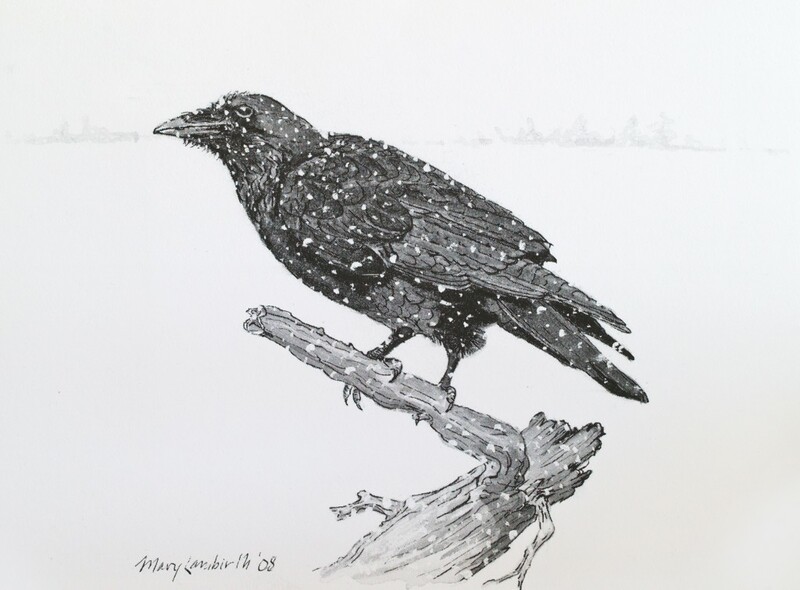 In the Boundary Waters area, ravens are on the southern edge of their range, but they are also found in the much colder Hudson Bay Lowlands, as well as Greenland and Siberia. They don’t go south for the winter; but stay in the north and rely on their intelligence, adaptability and omnivorous feeding habits to get through our long winters. Ravens don’t seem to merely survive the winter; they seem to thrive and even prosper in the cold. Ravens are predominantly a northern bird. All northerners, no matter where in the world they live, have one bird species in common: the raven. Not only is this large black bird found all across northern North America, it is also found in Greenland, Iceland, and across northern Europe and Russia. The raven, Corvus corax, is at home in both Upsala, Ontario and Uppsala, Sweden. In North America, ravens have extended their range even beyond the tundra, boreal forest and mixed forest. They are also found in mountainous areas and even in deserts. 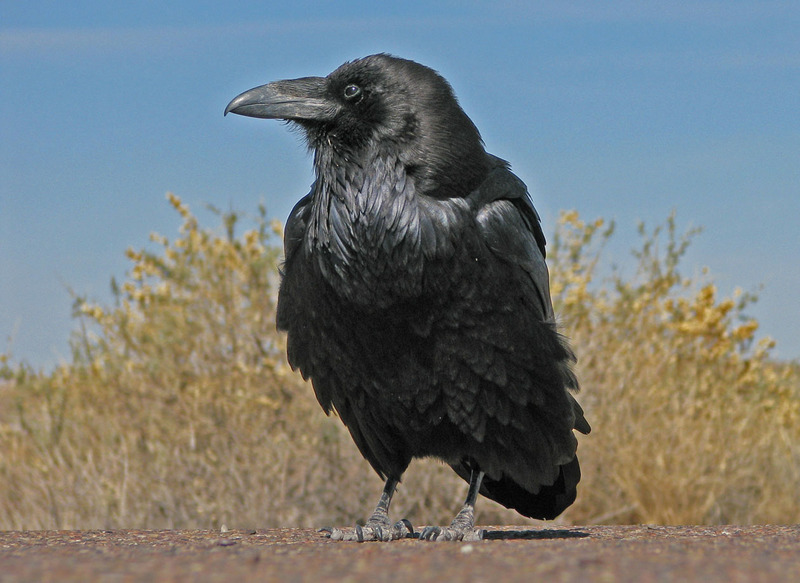 Consequently, ravens are in Ely, Nevada as well as Ely, Minnesota. In the mixed forests of the Boundary Waters area, the ravens range overlaps with that of its close relative, the common crow. The main difference between them is that the raven is much larger than the crow; has a larger, thicker beak; and has a wedge-shaped tail rather than the squared end of the crow’s tail. Ravens are common throughout the Boundary Waters area, but crows seem to be more plentiful in the BWCAW than in Quetico. One biologist has said that ravens make a wider variety of sounds than any animal other than humans. The call that I have heard them make the most often is a deep call that sounds like “kraa” and is sometimes repeated many times. It seems similar to the “caw” call of the crow, but is much deeper and less strident. They also make a “clunk” or “thunk” sound that is unlike any other bird sound I have ever heard. In contrast to these one-note sounds, they can also make very soft, melodious sounds that make the raven the world’s largest songbird. Their most striking and unusual sound is a bell-like note that I’ve heard a few times while they were flying in late winter. They also do spectacular dives and rolls during this time of year. These unusual sounds and aerial acrobatics may be related to their mating season, which also occurs in late winter. Ravens usually build their nests in trees but, when available, they nest on the side of cliffs. They apparently seek out cliff sites where they can build a nest under an overhang. 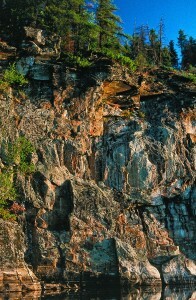 A nesting site on the cliffs on the north shore of Quetico Lake has a large overhang that completely protects the nest. 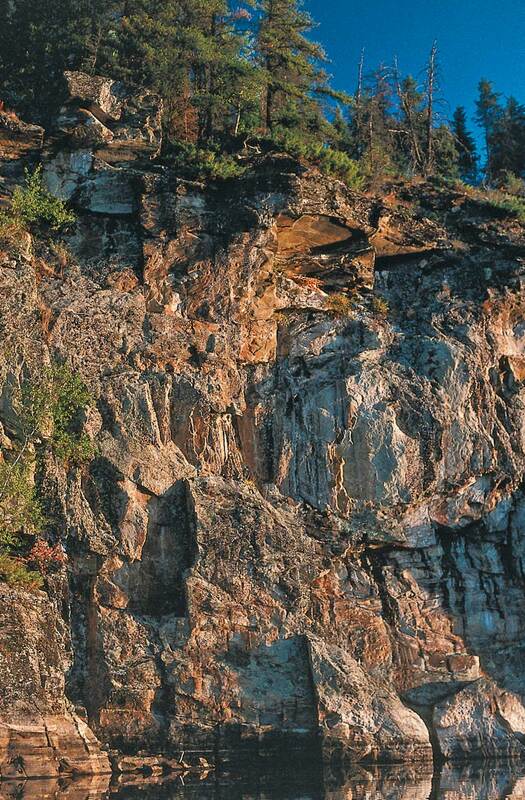 I first saw this wonderful Quetico Lake cliff nest in 1976 and it was still in use last year. Ravens mate as early as February and are on their nests in late March and April. Since they are on their nests when both snow and freezing rain can occur, nests with an overhang to protect both the incubating adult raven and its chicks is a huge advantage. The raven plays a major role in the mythology of many Native American cultures. In Pacific Northwest mythology, the raven plays a central role, and is known as both a creator and a folk hero. Many Ojibwa and Cree tales from our area also feature ravens. 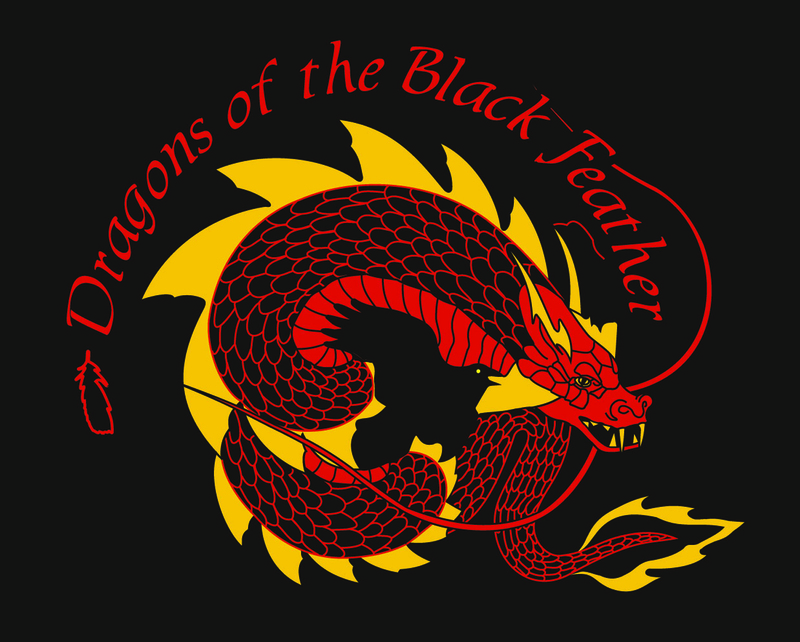 In many of these tales ravens are “tricksters”, creatures that are capable of heroism and courage, but also of trickery and even deceit. In early European cultures, ravens also played significant roles. In Norse mythology two ravens, Hugin (thought) and Munin (memory), flew off at dawn and observed what was happening in the far-flung Norse realm. They returned in the evening, perched on the shoulders of the Norse god Odin, and whispered to him what they had learned during their day’s travels. Information received from ravens, because they could observe and understand things that were beyond the comprehension of mere humans, was considered to be extremely valuable. In Ireland, the phrase “raven’s knowledge” means to know all and to see all. Although ravens are no longer common in England, they were so abundant in London in the late 1600’s that the King was petitioned to get rid of them. Ravens were held in high esteem by many and there was opposition to this extermination plan. According to the book Ravens in Winter, the raven extermination was not completed because a family of ravens lived in the Tower of London and a “soothsayer advised the King that if he removed all the ravens from the Tower a great disaster would befall England and his Royal Palace would crumble into dust. 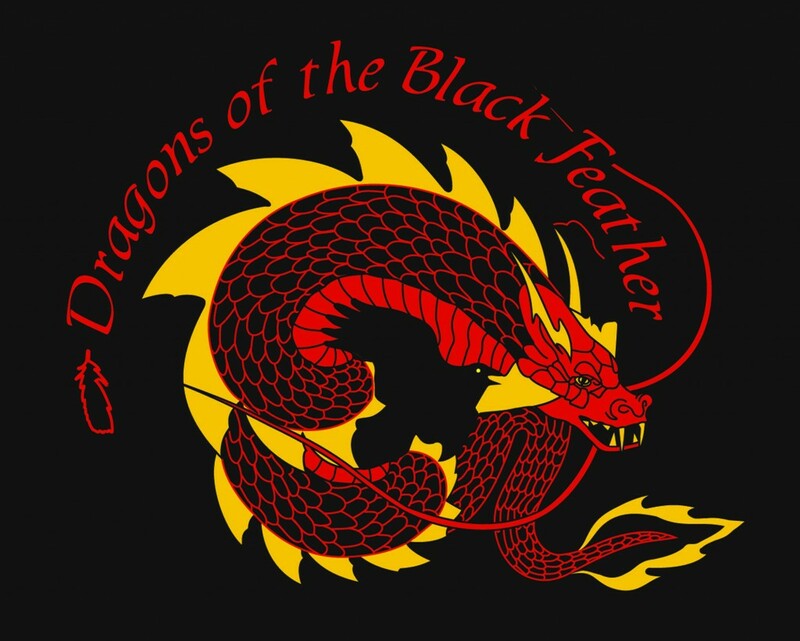 The King, not wanting to tempt fate, decided to keep six ravens and appoint a Keeper.” They are still there today, but their wings are clipped to ensure that they don’t leave the Tower. The Tower ravens don’t successfully breed, but whenever one dies, it is replaced by another bird. Another centuries-old tale states that a raven’s head buried at the base of London Tower protects London from invasion. Ravens are both predators and scavengers. As predators, they kill frogs, snakes, mice, voles, young and wounded birds, eggs, as well as a variety of insects and other invertebrates. One naturalist has labeled ravens the “bikers of the bird world” because they “dress in black, are big, and they are mean”. I’m not sure what the “mean” reference is for , but they do occasionally act as predators on surprisingly large animals. A few years ago, farmers near Dryden, Ontario (north of Atikokan) reported that ravens were killing their sheep and cows. Ravens were seen landing on the heads of these farm animals and driving their beaks into the eyes of their prey. A few hard, well-placed blows were reported to kill the animals. Ravens are evidently capable of killing domesticated animals as large as cows. At the other end of the food spectrum, they also eat some plant foods, and have been observed consuming large amounts of blueberries. The extremely diverse diet of a Boundary Waters raven can include large and small mammals (in any state of freshness or decay), snakes, turtles, frogs, toads, minnows, crayfish, tadpoles, worms, insects, seeds and berries. They are omnivores and opportunists of the highest magnitude. Ravens seem, however, to get the vast majority of their food by acting as scavengers. In the winter, they rely heavily on feeding on moose and deer carcasses. They seem to have a symbiotic relationship with wolves and have been reported to follow wolf packs. There have been reports of ravens apparently signalling the location of prey to wolves by circling over moose and calling loudly. Not only do wolves kill the animals, they also open the carcass so the ravens can get at the meat and organs. Ravens also commonly arrive quickly after human hunters have killed an animal. They also take advantage of animals killed by vehicles by flying along highway corridors and feeding on the road kills. A raven's nest on a south-facing cliff on Quetico Lake. 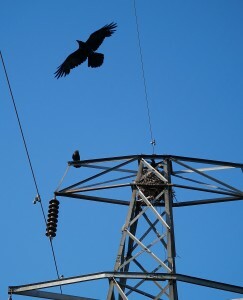 Raven's nest in a transmission tower in Thunder Bay, Ontario. and many biologists consider them to be the most intelligent bird of all. They exhibit their intelligence in numerous ways. They have been observed opening clam shells by dropping them on rocks or pavement. They are also excellent mimics, not only of other birds, but also of the human voice. The late Konrad Lorenz, a renowned animal behaviourist, had a pet raven. He once fed this raven after it had brought him a piece of laundry that it had obtained from a clothes line. The raven, thinking it had been rewarded for bringing laundry, made repeated raids on neighbour’s clothes lines. The raven kept bringing wet socks and undergarments until it realized it was not going to be rewarded again. One of the fascinating things about ravens is their ability to thrive in towns and cities as well as in wilderness areas. The same species that nests on cliffs on Quetico Lake and near the top of old-growth white pines throughout the Boundary Waters also nests on a large steel electrical tower on a busy street in Thunder Bay. I see ravens all summer in Quetico, but we also commonly have ravens in our backyard in Thunder Bay. They habitually search for animals that have died of natural causes or been preyed upon in the wilderness, but they also routinely inspect the back of hunter’s or trapper’s half ton’s looking for morsels of meat. Always the opportunist, I once saw one fly across the road at the French Lake campground with a whole sandwich in its beak. My Norse ancestors, like many Native American cultures, not only believed they could learn from these intelligent and adaptable birds, but, also wove them into their mythology and spirituality. Since ravens have also successfully made the transition between wilderness and human-dominated landscapes, maybe we also have more in common with these intriguing creatures than we think. I enjoyed the site and like the drawing of the raven. I lived with ravens in CA and noticed that they lived in different valleys than crows. There are no ravens here in Racine, WI and I miss seeing them. I wish PBS Nature program would do a story of ravens after doing such a nice one on crows last week. I enjoyed your article which I came upon while searching for corroborating stories to my having seen many huge ravens while working in Thule Greenland. There are those who believe that I am exaggerating when I claim to have seen them with a wing span of 6-7 feet. Have you heard of this? I have never seen ravens of that size in my travels, the ravens in northwestern Ontario have wing spans up to five feet. Ravens may be larger than that in Greenland but I’d be surprised if they had wing spans of up to 7 feet. If you go back be sure to ask locals about the size of their ravens. Question: why do they hop about so much, almost as though getting ready for flight? I really enjoyed reading your site!